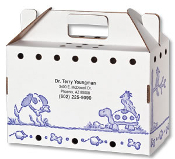 Pet Carriers – Pet carriers always come in handy. Easy to assemble and constructed from one piece of cardboard, these heavy duty pet carriers are well-ventilated and ideal for pets 20lbs. or less.